The ranking coincides with the online undergraduate program’s fifth birthday. The University of Florida (UF) continues to be the top-ranked public university for online undergraduate programs in the state of Florida, according to the U.S. News list. With 20 majors in the program, students in UF Online learn from the same reputable faculty that teach students on campus. Nine University of Florida colleges offer degrees through the UF Online pathway: College of Agricultural and Life Sciences, College of Education, College of Health and Human Performance, College of Journalism and Communications, College of Public Health and Health Professions, College of Liberal Arts and Sciences, College of Nursing, the Warrington College of Business and the College of Design, Construction and Planning. Courses are also taught and offered by faculty in the Herbert Wertheim College of Engineering and the College of the Arts. 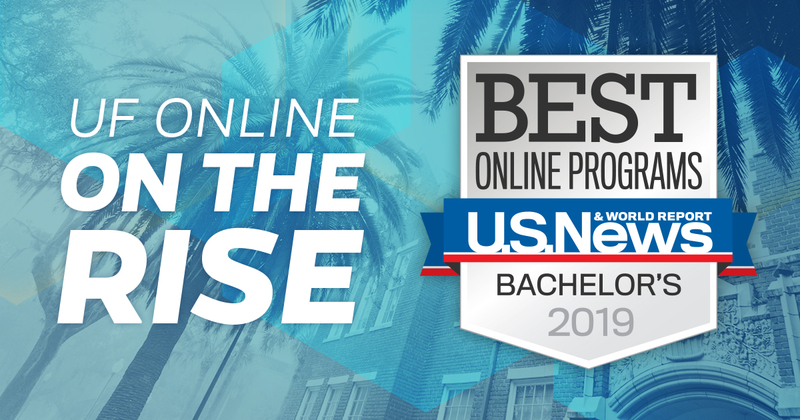 Review the rankings for the Best Online Bachelor’s Programs on the U.S. News site. Read more details about UF Online in its U.S. News profile. Check out the University of Florida’s announcement on UF Online’s rankings here. Visit our site for more information on how to apply. Our summer application deadline is Feb. 4 and fall application deadline is May 6. The University of Florida, ranked No. 8 in the list of top 10 best public universities by U.S. News, launched UF Online in January 2014. Students can select from 20 majors across a variety of disciplines as well as seven minors and work with a dedicated academic advisor to design their own academic pathway. Degree programs are continually being added. Visit ufonline.ufl.edu to learn more.